ARPEX all-steel couplings are free of backlash, have a compact design and are characterized by a low power-to weight ratio. They are suitable for use at high ambient temperatures and particularly for machines that must be driven precisely, e.g. paper and printing machines, pumps, compressors and high-speed generators. 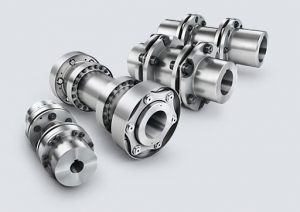 With numerous standard components, ARPEX couplings can be combined into a wide variety of designs that can be used in many applications. The product range includes eight different series with performance ranges from 92 Nm to 1,450,000 Nm. Arpex couplings are manufactured completely from steel, with torque transmitted by means of torsionally-rigid, flexible plates. The plates are held together by a sleeve and ring to form a compact plate pack. This ensures easy, operationally safe installation. Arpex coupling are also not subject to wear and, if correctly designed, assembled and installed, can be expected to have an unlimited service life. Thanks to a large number of standard components, this series can be combined to make many different types, further increasing flexibility.